Fettuccine Alfredo is known as one of the world's favorite pasta dishes, famous for its creamy, garlicky, cheesy flavors. This version swaps out the long fettuccine noodles for cheese-stuffed tortellini pasta, making the dish even more flavorful. The cream sauce is delicately flavored with garlic and cream cheese, making for a velvety smooth sauce that people won't be able to stop talking about — once they've finished their plate and asked for seconds! The recipe below could not be simpler — the whole dish can come together within a half hour, so you don't need to stress over time spent in the kitchen. Kids and adults alike will fall in love with this unique twist on a classic Italian staple. Heat a large pot of salted water on high until you get a rolling boil. Cook tortellini in the pot according to the package instructions for "al dente." Drain and set aside. Add the garlic and red pepper flakes to saucepan. Sauté until garlic becomes light-toasted and fragrant. Whisk in the flour until the mixture becomes lightly browned, about 1 to 2 minutes. Slowly whisk in the milk and half and half into the saucepan. Be sure to whisk constantly to break up lumps and ensure a smooth sauce. Cook until slightly thickened, about 3 minutes. Add the Parmesan and cream cheese to the saucepan, and stir together until the cheese has fully melted into the sauce. If the sauce is too thick, slowly add more milk, as needed. Season sauce mixture with salt and pepper, to taste. Carefully pour the tortellini into the saucepan. Gently fold them into the sauce until they're completely covered. Bring dish back up to temperature. 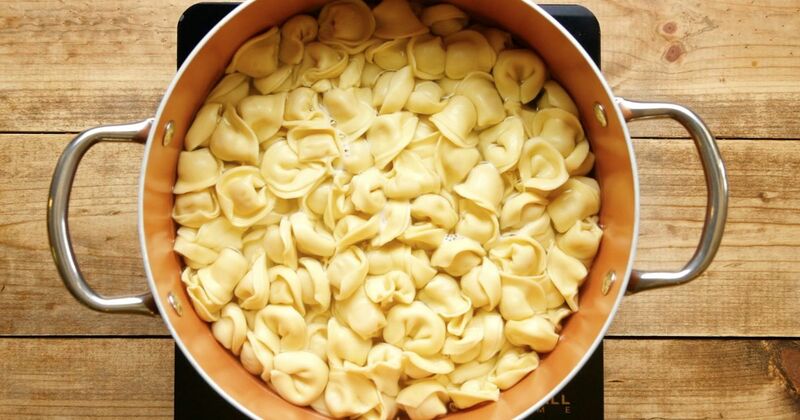 Once the tortellini are hot, remove from the heat. Toss with fresh-chopped parsley. Serve hot immediately on individual plates, and garnish with more parsley or Parmesan cheese. 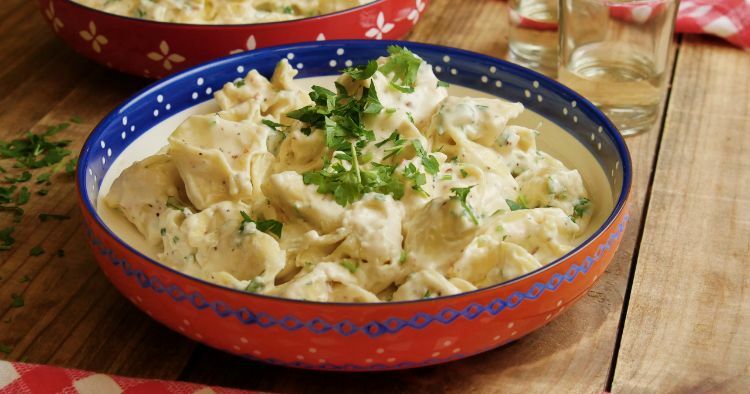 Pro-tip: Make this dish non-vegetarian by using chicken stock and chicken pieces for a delicious chicken tortellini Alfredo. Share this super-yummy dish on Facebook.